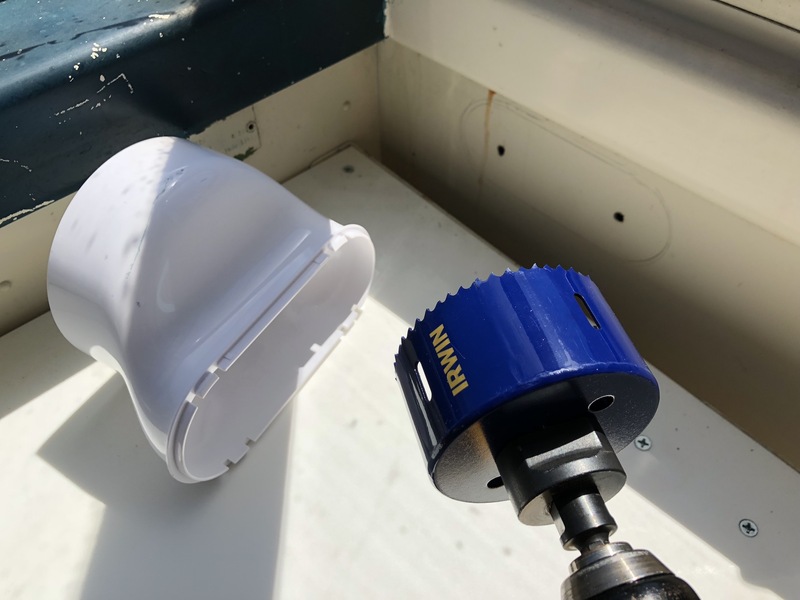 Yesterday my 3-3/8″ hole saw arrived from amazon.com so I started on the venting for my air conditioner. That plastic fitting is going to snap into an oval hole in the cabin wall. I started by tracing the fitting and then carefully checking all measurements. I want the fit to be tight, so I’ll “sneak up on it” while I cut. I drilled two 1/4″ pilot holes to make sure the wall cavity is hollow. Then the hole saw made quick work of the ends. I had to cut the top and bottom with a mini hacksaw, because none of my power tools would fit in there. This required about an hour and several F-bombs. 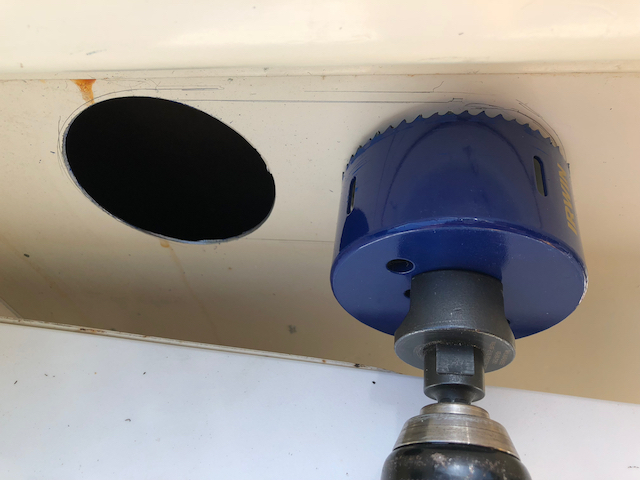 The fitting snaps into the hole with a little coercing, and the 6-inch flex hose just barely makes those turns without getting in anyone’s way. Okay, so that gets us venting warm air into the wall cavity, where the goal is to avoid any kind of vent hole on the outside fender. At first it looked like I was done because warm air was finding its way out through the wheel well. But soon that wall became superheated, and the air conditioner was struggling to knock even 10° off. So I spent the next two hours on my back drilling 1-1/4″ and 1-1/2″ ventilation holes up under the wheel well, in the floor of that narrow wall cavity. I was careful not to weaken that brace too much. And now, warm air positively blows out of those holes. This would allow the warm exhaust to flow mostly straight out, using the ventilation holes I drilled in the bottom to create a chimney effect. Since heat rises, cool air would be drawn in from the bottom, creating a convection current. That might improve efficiency pretty dramatically. This is another option. 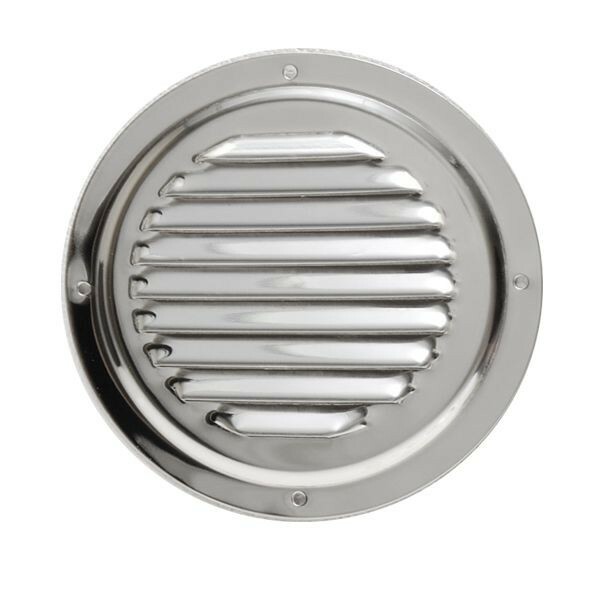 A simpler 5-inch round louvered vent from greatlakesskipper.com. They were both cheap so I ordered them to see which works better. 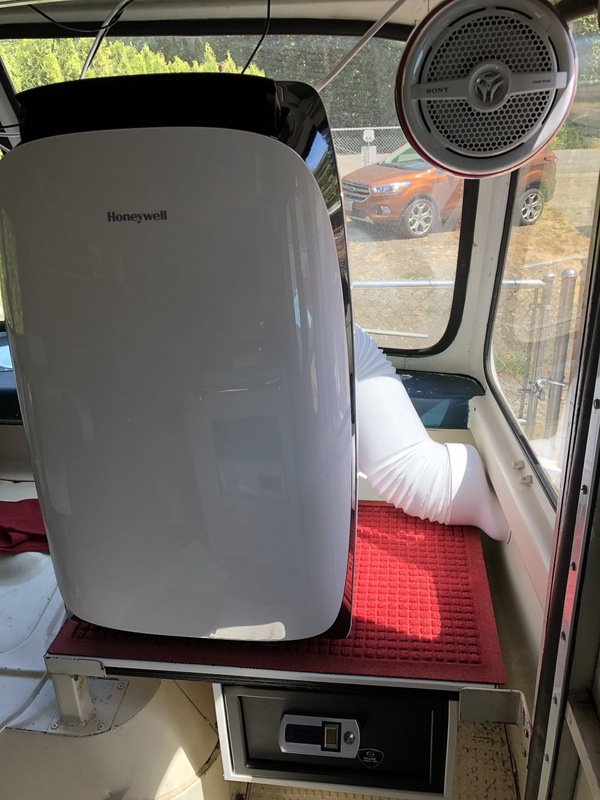 This Honeywell air conditioner is rated at 10,000 BTU and 450 square feet. The RETROvan is only around 100 square feet. It’s fairly well insulated but it’s not air-tight. So if this unit doesn’t perform up to expectation, they do make 12,000 and 14,000 BTU models in the same form factor. Buying this one from Home Depot was strategic because they have a 90-day return policy. So, bring on the heat now, Mother Nature! UPDATE: This air conditioner just isn’t cutting it. The best performance I’ve seen is an 11° delta. But once the outside temperator hits around 96°, that delta shrinks to 6° making the inside of the RETROvan a sweltering 90°. I need there to at least be a 15° delta for this to be worthwhile. It’s just too hard to work above 85°. So, I’ve ordered Honeywell’s $450 14,000 BTU model and will return the $350 10,000 BTU model to Home Depot once it arrives. The units are the same size and style, so it’ll be a simple swap-out of the main unit.